The title of John Ford's Fort Apache promises a rollicking Western adventure, a cowboys-and-Indians shoot 'em up with plenty of thrills. The film does, eventually, deliver on this promise to some extent, but it is not Ford's central concern in this picture. He's much more interested in the routines of military life, the daily ebb and flow of life at a small fort on the very edge of the frontier, and the psychologies of the men and women who populate this place. In fact, for the first hour of the film, there's nary an Indian or a firefight to be found, as new fort commander Owen Thursday (Henry Fonda) arrives with his daughter (Shirley Temple) and settles into his new life at Fort Apache. Thursday is an ambitious man who feels as though he's been given short shrift with his new assignment, and he's deeply discontented but determined to turn this misfortune into a new chance for further advancement in his career. What he finds when he arrives at the fort, though, is not particularly promising to him. The men at the fort have degenerated into slack military discipline under the loose, comradely command of Sam Collingwood (George O'Brien). They aren't bad soldiers by any means, and many of them are seasoned ex-Confederate officers now saddled with ranks far below their former standing, but they fail to meet Thursday's exacting standards of traditional military protocol with their irregular dress and fun-loving antics. Ford spends a tremendous amount of time carefully developing the denizens of the fort, creating a large cast of memorable and colorful characters who add life and vitality to the film's portrait of military life. In addition to Collingwood, there's Michael O'Rourke (Ward Bond), part of a distinct Irish subculture within the fort, all of whom unsurprisingly drink prodigious amounts, but who are nonetheless differentiated and developed in other ways so that they don't become mere stereotypes. O'Rourke is joined at the fort by his son (John Agar), a newly minted West Point graduate who thus outranks his own proud father, and who falls promptly in love with Thursday's daughter. But the main presence at the fort is Captain York (John Wayne), an eminently capable soldier with an intimate knowledge of (and deep-seated respect for) the culture and tactics of his Apache foes. In this way he is the exact opposite of Thursday, who knows little about Indians and cares even less about them, except as a ticket to his own glory. The rivalry between Fonda and Wayne is the film's unspoken core dilemma, though Ford surrounds this central conflict with a large array of subplots and character moments. The film moves along, not as a straightforward linear narrative, but in fits and starts, jumping around among the fort's many residents and the variety of stories contained in its walls. This large cast, along with their wives, forms the basis for Fort Apache's richly textured sense of place and characterization. Ford spends a full hour with these people, simply following the daily routines of the fort, before even the least hint of external conflict enters the film via an Indian attack on a telegraph post outside the fort. 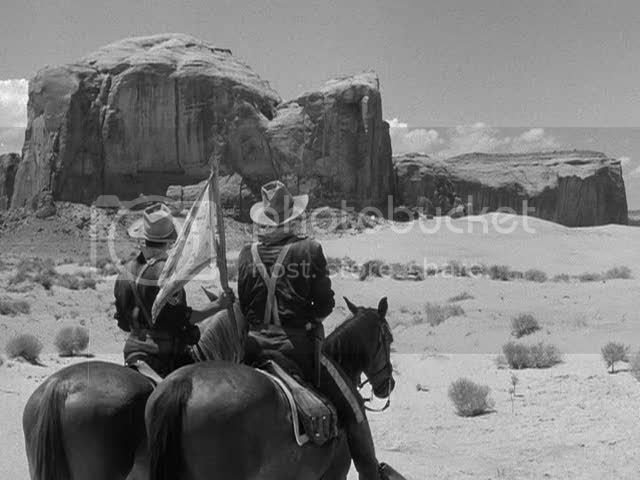 Even after this point, Ford keeps the film's focus squarely on more mundane matters inside the fort, with only a brief and barely-shown skirmish with the Apaches before the final battle at the end of the film. It's this focus on character and domesticity, rather than action, that makes Fort Apache such a deeply satisfying film. The film is also interesting because of the way it deals with the traditional depiction of the American wars against the continent's native inhabitants. Ford has often been criticized for his depictions of Native Americans in his Westerns, and it's undeniably true that the Apaches are not defined or developed anywhere near as much as the whites at the fort. This is a film told completely and unapologetically from the white point of view, indulging in the usual polarizing of Indians into either "noble" primitives or fierce savages. And yet despite these inherent limitations of Ford's outlook, he hardly presents a wholly negative view of the Apaches, and indeed makes it clear that the Native Americans were exploited, manipulated, and systematically deceived by the white "heroes" of the West. Ford also can't seem to resolve the considerable tension between his mythologizing of American military culture and the disgusting, suicidal, and mean-spirited orders often handed down from the upper echelons. Ford glorifies the average soldier, as personified here especially by Wayne, but provides him with no out from the rigors and necessities of military discipline, even when military procedures lead to the grossest betrayals of trust and common morality. The result is a highly ambiguous presentation of the myths of the American West; Ford seems to love these myths while simultaneously delving into their darker corners and shining the light in. Fort Apache is deeply rooted in America's self-mythology of its past, and Ford is able to explore this mythology with subtlety, pathos, and the kind of insight that can only be born of a genuine love for the subject at hand. The Marrying Kind shares some traits with the other George Cukor films I've seen and loved, namely Holiday and The Philadelphia Story: class-consciousness, troubled romances and especially the breakup of marriage, and characters learning the difference between their ideas about life and the realities they encounter. It's clearly of a piece with the director's classic work, then, at least thematically, but this film lacks some extra spark that might have elevated it to the high level of those earlier films. Judy Holliday and Aldo Ray (in his starring debut) give fine performances as Florence and Chet, a young married couple who after many years together are on the brink of divorce. They wind up recounting key events from their married life to a divorce judge as they try to describe how they got to this point and why. The bulk of the film is thus told in flashback, usually a clunky device even in the best of hands, and in this case further crippled by the fact that most of the lengthy flashback scenes begin with the couple supplying dueling voiceovers atop a silent montage. This cheesy device renders a lot of the comedy sadly inert, which is a problem since the film is clearly intended to be a comedy at least for the first 45 minutes or so, before a drastic mid-film switch in tone. There are some great moments in the film's first half, without question. Most notable is a hilarious dream sequence in which Chet moves fluidly from his bedroom to his job at the post office, where his brother-in-law is introduced as the President of the United States and slips on some ball bearings that Chet failed to clean up, resulting in a slapstick chase in which a pair of soldiers try to shoot him. Holliday also excels at delivering some of the script's subtler one-liners, as in a quietly funny scene where she's having lunch with her mother and Chet's sister. The banter is often quick and sharp, but not nearly as memorable as the best one-liners and rapid-fire exchanges from the earlier screwball comedies on which this film is clearly basing its template. It also doesn't help that Aldo Ray, though not without his charms as an actor, simply doesn't seem to have the temperament for this kind of comedy, and he just comes across as awkward. It's probably not all his fault, though. The script itself is pretty awkward as well, not to mention shrill and often painfully unfunny when it's going for laughs. If the first half of the film is mostly just undistinguished mid-tempo comedy, the second half veers into some truly bizarre tonal shifts without ever resolving the discrepancy between its new darker undercurrents and the film's comedic material. Midway through, the couple tells the story of how their older child, their boy Joey, drowned in an accident at a picnic. This sudden shocker completely disrupts the narrative and its comedic tone, but the script never quite goes all the way with this incident, and from that point on the film seems unsure of just what it's supposed to be. The child's death, for one thing, is never quite as devastating as it should be  the couple has one scene where they break down in front of the judge remembering it, and then they're over that speed bump and onto the rest of the story. The problem is that the narrative doesn't weigh this life-altering event any more heavily than any number of other more trivial problems that the couple faces over the course of their marriage: money woes, petty jealousy, the husband's insecurity over his economic status. The child's death is just one more problem they have to face, and once it's ticked off on the list of things that caused their marital problems, the story jolts along to the next flashback. But the pall of this scene hangs over the rest of the film nonetheless, and the periodic attempts to re-inject some light banter into the proceedings fall flat because this tragedy hasn't been properly dealt with. The rest of the film staggers along from this point on, towards the inevitable conclusion where the couple gets back together. It's a highly unsatisfying outcome, not just because it's predictable, and not just because the bumpy storytelling lessens the audience's interest in the narrative's resolution altogether. It's really a question of the film never actually bothering to show Chet and Florence as a happy couple to begin with, although we're meant to believe that they were happy and in love at one point. The scenes of this supposed marital bliss are so perfunctory that most of them are skimmed over in the flashback montages, usually with the modern-day couple bickering in voiceover as their happy earlier images cavort and laugh. The screenplay doesn't establish or develop this happiness, it merely assumes it in a rush to get to the real meat of the divorce hearing. But without some investment in these characters, who are sparring and bickering and seem ill-matched from the very beginning, the romance never becomes the least bit believable, and their reconcilement is hardly credible, let alone rooted for. Even so, the film does have some interesting points. It's notable especially in that it allows Cukor to approach his interest in class-conscious romance from a much different angle. Whereas Holiday and The Philadelphia Story both feature lower-class interlocutors in a high-society world, The Marrying Kind is a strictly working class story, rooted deeply in the world of its working class protagonists. The script doesn't flesh these characters out much or make much effort at understanding them at any more than a surface level, but it's still at least a well-meaning attempt to get away from Hollywood glamour and show "real" people in a romantic comedy. The day-to-day concerns of income, promotions, rent, furnishing and keeping up a home, and raising children with little money drive the narrative forward. Cukor is clearly interested in the prosaic qualities of domestic life, its petty daily problems and the way class issues can impact romance and love. But the uneven script keeps the film from ever delving too deeply into these more interesting subtexts, and the result is a periodically engaging failure. I haven't seen it in a number of years, but my recollection of The Marrying Kind is more positive than yours. It starts as what looks to be a romantic comedy about a couple reconciling, but it goes elsewhere fast. At the end they're together in shared grief and helplessness. I found the scene of the child's drowning gut-wrenching. The film it ultimately recalls is Vidor's The Crowd. At the same time it testifies to the impact neo-realism had on Hollywood filmmaking. I like the idea of Marrying Kind, as you describe it, quite a bit. I thought it was handled a bit awkwardly in practice, though. The actual scene of the child's drowning was indeed gut-wrenching, and the immediate aftermath of both parents breaking down in the courtroom as well. It's just that after this, the narrative quickly diverts away from this moment of grief, and ultimately the child's death isn't weighed much more than any number of other incidents in the film. I'd attribute the film's failings, for me, mostly to the script -- individual moments like the tragic picnic are well-acted and filmed so they have power and impact, but the pacing and structure of the film doesn't allow anything to come together in any coherent way. This had an enormous impact on me when it was first released because this is the class I came from and these characters were people I knew intimately. JUdy Holliday and Aldo Ray were EXACTLY like our next door neighbors in Queens. It was deeply shocking to see such a realistic film come out of Hollywood at that time. I can see that for sure. It must have been quite a different thing to see this coming out in its original context -- I can imagine it really being a breath of fresh air in that regard. The central conceit of making a "working class" screwball comedy that soon spirals into darker waters certainly must've made this totally unlike anything else coming out of Hollywood at the time.